The Operation School Bell program provides new clothing, shoes, school and health supplies to elementary school children in need. 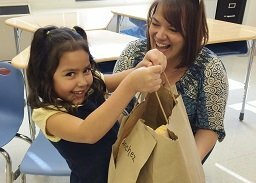 Our “bag & deliver” program provides each child a pair of jeans, two shirts, six pairs of socks and underwear, a pair of shoes, and a lined windbreaker. Clothing is sized by parent survey and children are fitted by shoe company personnel, assisted by our volunteers. 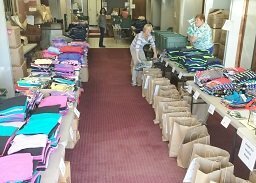 Our volunteers package all the clothing for delivery to the school. 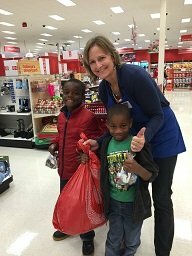 We also have an “in-store shopping” program where we shop with families to purchase $72 worth of clothing or shoes for school for their children. All participating children in both methods of delivery receive toothpaste, toothbrush, and deodorant for older children. We also provide assorted school supplies and backpacks to counselors to distribute for these children. We work directly with the staffs of Wake, Durham, and Orange County public elementary schools to provide services to those students the school deems most in need. We also work through the school system coordinators for homeless children in the schools.